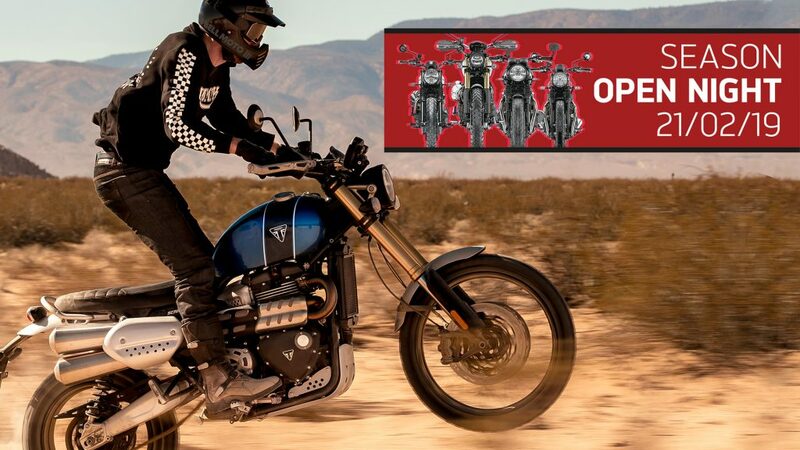 Triumph Dealer Open Evenings – our friends at Triumph are hosting open evenings at dealers on Thursday 21st February to reveal the British marque’s new 2019 models and celebrate the full MY19 Triumph motorcycle range. Fans will have the opportunity to view the entire Triumph line-up, including the recently launched Street Scrambler and Street Twin. Also on display will be the stunning new Scrambler 1200 and Speed Twin, priced at £11,500 and £10,500 respectively. Both built around Triumph’s high performance 1200cc Bonneville twin, the Scrambler 1200 XC and the top-of-the-range XE are designed for peerless style and capability, for genuine adventure and for full-on scrambling. As well as displaying the latest Triumph range, each local dealer event will include clothing displays, food & drink, and much more. To locate your nearest event, go to Triumph’s find a dealer page. If you’d like a longer test ride on any of the bikes before buying then the new Speed Twin and Scrambler 1200 will be joining the Spyder Motorcycles fleet this year. Alongside the ever popular Tiger 800 and 1200 it’s a great opportunity to try before you buy. Current Spyder Motorcycles Triumph hire fleet can be booked here.